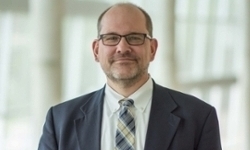 UNMC › Pathology and Microbiology › Faculty › Bios › Paul D. Fey, Ph.D.
For more details on Dr. Fey's research, please visit his webpage. October 2016: NIH/NIAID ZRG1 IDM-B (80) S Topics in Bacterial Pathogenesis Study Section. March 2016: NIH/NIAID ZRG1 IDM-B (80) S Topics in Bacterial Pathogenesis Study Section. C.T. Marolf, R. Alter, E. Lyden, P.D. Fey, M.E. Rupp. 2017. Susceptibility of Nosocomial Staphylococcus aureus to chlorhexidine after implementation of a hospital-wide antiseptic bathing regimen. Infect Control Hosp Epidemiol. 5:1-3. doi: 10.1017/ice.2017.80. Cortney R. Halsey, Shulei Lei, Jacqueline Wax, McKenzie K. Lehman, Austin S. Nuxoll, Laurey Steinke, Marat Sadykov, Robert Powers, and Paul D Fey. 2017. Amino acid catabolism in Staphylococcus aureus and the function of carbon catabolite repression. mBio 2017 Feb 14;8(1). Andre C. Kalil, Mark L. Metersky, Michael Klompas, John Muscedere, Daniel A. Sweeney, Lucy B. Palmer, Lena M. Napolitano, Naomi P. O'Grady, John G.Bartlett, Jordi Carratal, Ali A. El Solh, Santiago Ewig, Paul D. Fey, Thomas M. File, Jr., Marcos I. Restrepo, Jason A. Roberts, Grant W. Waterer, Peggy Cruise, MLIS, Shandra Protzko, MLIS, and Jan L. Brozek. 2016. Executive Summary: Management of Adults with Hospital-acquired and Ventilator-associated Pneumonia: 2016 Clinical Practice Guidelines by the Infectious Diseases Society of America and the American Thoracic Society. Clin Infect Dis 63(5):575-828 doi: 10.1093/cid/ciw504. International Typhoid Consortium, Wong VK, Holt KE, Okoro C, Baker S, Pickard DJ, Marks F, Page AJ, Olanipekun G, Munir H, Alter R, Fey PD, Feasey NA, Weill FX, Le Hello S, Hart PJ, Kariuki S, Breiman RF, Gordon MA, Heyderman RS, Jacobs J, Lunguya O, Msefula C, MacLennan CA, Keddy KH, Smith AM, Onsare RS, De Pinna E, Nair S, Amos B, Dougan G, Obaro S. 2016. Molecular Surveillance Identifies Multiple Transmissions of Typhoid in West Africa. PLoS Negl Trop Dis Sep 22;10(9):e0004781. doi: 10.1371/journal.pntd.0004781. H. McCarthy, E. Waters, J. Bose, S. Foster, K. Bayles, E. O'Neill, P.D. Fey, J. P. O'Gara. 2016. The major autolysin is redundant for Staphylococcus aureus USA300 LAC JE2 virulence in a murine device-related infection model. FEMS Microbiol Lett 363(9). pii: fnw087. doi: 10.1093/femsle/fnw087. V.K. Yajjala, V.C. Thomas, C. Bauer, T.D. Scherr, P.D. Fey, K.W. Bayles, T. Kielian, and K. Sun. 2016. Resistance to Macrophage killing promotes airway fitness of prevalent community-acquired S. aureus strains. J Immunol 15;196(10):4196-203. doi: 10.4049/jimmunol.1600081.